Oh no, there goes Tokyo! Go go Godzilla! This is pretty much a new pattern, maybe a month old. (Free too!) There is a part of me that loves finding it before it’s had a chance to go viral or have many projects before mine. I have these delusions that someday I’ll make That Project. You know the one; the one that everyone on Ravelry sees and exclaims how it’s made them see the pattern in a new light and they will now make it. Perhaps it’s time to talk to someone about my ego. Ahem. I noticed a very minor error in the instructions, but it would be easy enough for anyone to figure out and know to change it, I think. In the instructions for the spines, row 5 reads, “5,” when it should read, “k,” for knit the row. Very minor. I did make changes to the pattern. The entire thing is written to be knit flat. A lot of seaming. 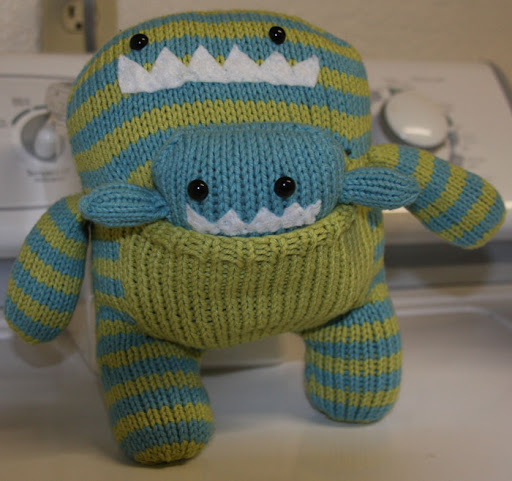 I converted all pieces, minus the legs and spines, to be knit in the round. It worked just fine and left a nice, neat guide for sewing the spines onto the back. The instructions for the face call for embroidering the whole thing, but I prefer the look and ease of safety eyes. So, I stuffed the head, placed the eyes in, and then gently removed the stuffing so I could snap the washers onto the eyes. Then while the face was still waiting to be re-stuffed, I figured out where I wanted the mouth to go. I did a straight line and then made it dip in the middle using an embroidery stitch I can not recall the name of–it’s that one used to make flower petals and such. Then, I went back and back stitched over the mouth a second time to make sure it was nice and secure. My kids love to pull on threads and mess them up otherwise. The final change I made was to the tummy panel. 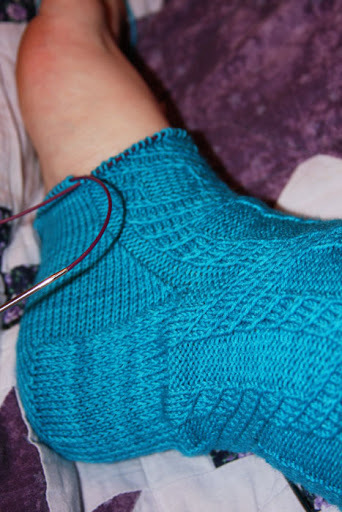 In the pattern, the decreases are both written at K2tog; instead, I did mirrored decreases with a SSK. Minor, but I think it made a difference. And that’s it: my FO post for the month. 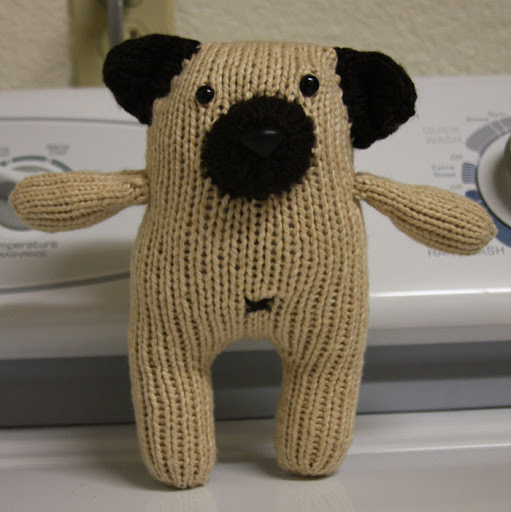 Be seeing you all in blogland or on Ravelry! This will likely be my last one for about a month, kittens. I’ll try to do an FO post before I go; we move on Monday & no internet starting Sunday. 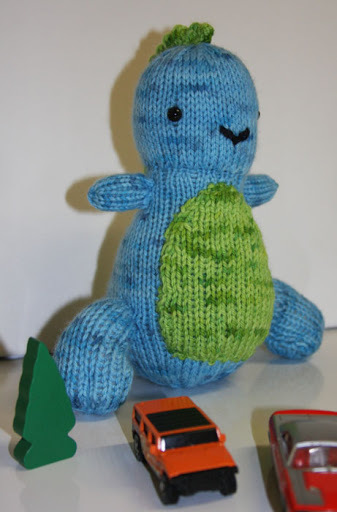 This was a super easy and fast knit that I pulled out at the last minute for The Boy, who turned 4 a couple of weeks ago. I see a lot of possibilities with this pattern as a base. The technique could easily be altered to yield differently shaped monsters. 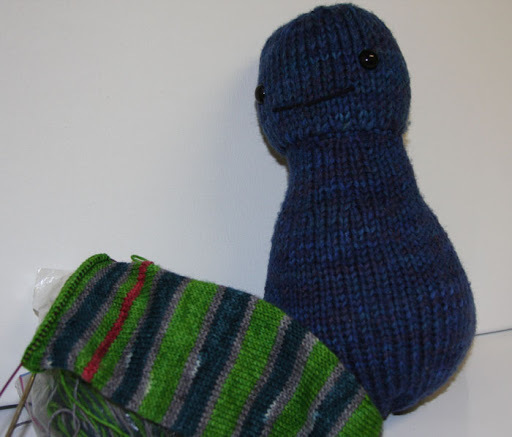 In fact…it’s almost the same technique used for my next FO, just with different head shaping. Again, super easy to follow and quick knit. I wish I were a bit better at getting features attached evenly, but I think he turned out all right. He’ll be going to his new home in a couple of weeks. Yay for babies! 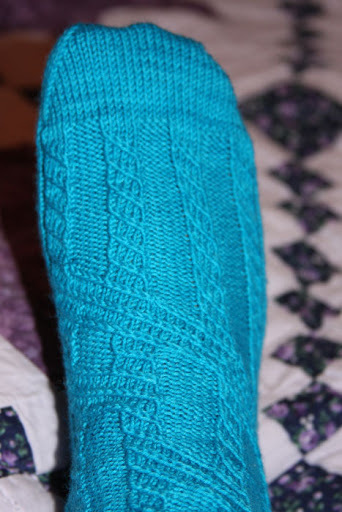 I have a finished right sock. Now, to finish up the left one. Sorry y’all…I am dead tired here. Accidental gluten ingestion. Just a picture today. So May’s yardage was not too much better then April’s. I’ve been feeling more “into” my knitting, but since most of what I’m working on is socks, the yardage isn’t exactly impressive. Regardless, I’m still averaging just over a mile month being knit. In June, I plan to focus on finishing up what few WIPs I have the first half of the month. Once we move in two weeks, I’m not sure what I’ll be working on yet. I’m still contemplating car/travel friendly projects.